healing and general well-being. It is universally accepted as the oldest highly advanced closed-door healthcare science. It was practiced only by the elite, ancient noble class rulers and palace guards. There are many types of Tai-Chi. Hwa Yu Tai-Chi has been recommended for centuries for the prevention, treatment and reversal of a wide range of common disorders. 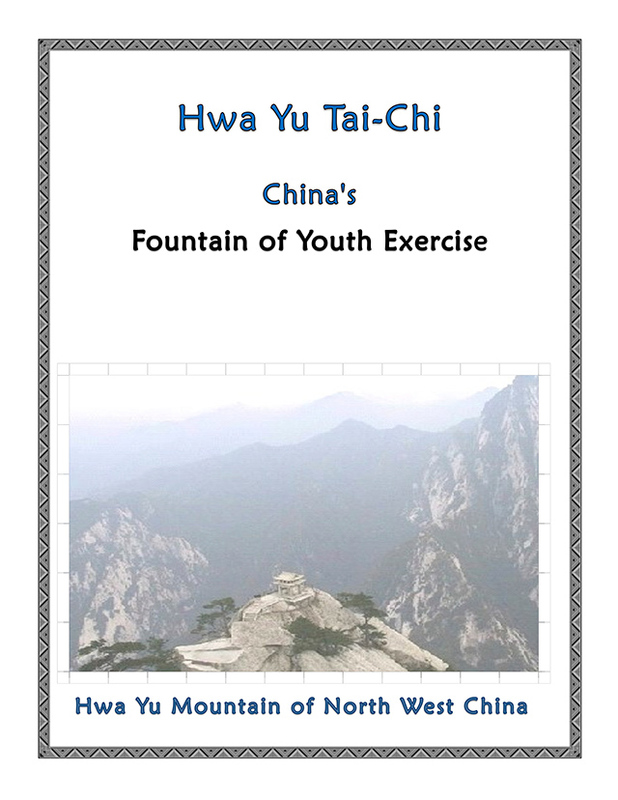 Hwa Yu Tai-Chi, affects every system in the body to encourage its restoration of function. Performed with slow, graceful movement, it is accompanied by powerful, yet calming, mental concentration that revitalizes the practitioner. The Harvard Health Publication has called Tai-Chi "movement medication." practice of this graceful healing form incredibly benefits all who study it. Hwa Yu Ta-Chi is a precious, rare health treasure that is a key to an abundantly full life. Age and physical condition rarely are barriers to its practice. Hwa Yu Tai-Chi physical conditioning promotes strength and increases bone density and suppleness in the joints and limbs through gentle twisting, bending and stretching movements that, also, free limbs from harmful adhesion. It comprises hundreds of sequenced, rounded, graceful and balanced movement patterns. It is a moderate daily exercise program that will serve to counter negative, cumulative daily stress, while lowering blood pressure, increasing circulation, stamina and re-energizing a person both mentally and physically. The Hwa Yu Tai-Chi methods and principles of practice greatly increase the student's awareness of centered posture and body alignment that will improve their reaction reflex, perception and coordination. The Hwa Yu art has a propensity to free its practioners to be more creative mentally, while gaining more flexibility, grace and range of movement physically. The art teaches stress management in handling crisis situations. The effectiveness of this type of self-defense is startling in its simplicity. The art is designed to assist practitioners to break through the fear of failing, to live more intelligently and responsibly and to be able to make sensible and healthy lifestyle choices. Hwa Yu Ta-Chi's movement vocabulary is a must for anyone who is sensitive to the aesthetic beauty of movement arts and for those individuals who sincerely desire to heighten their kinetic balance and to excel in any physical endeavor. 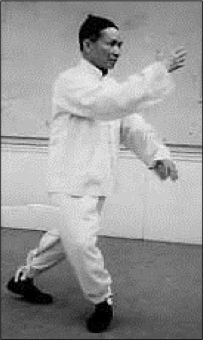 Hwa-Yu Tai-Chi was first known during the early part of the Sung Dynasty (960 – 1270 AD) as Lop Hop Pak Fat (Liu Ho Pa Fa), which translates as "Six Combinations Eight Methods." Master Chen Hsi-I, founder of Lop Hop Pak Fat, was fascinated by the fluid, ever-changing character of water. His observation carried over into the belief that nothing is so yielding, yet possessing so great a force. Chen Hsi-I was also influenced by the "Animal Exercises for Health," which were created prior to the Sung dynasty. Hwa Yu Tai-Chi is exceptional health exercise that provides excellent therapeutic, restorative healthcare that may assists a practitioner in day-to-day professional and personal relationships. Renowned to aid longevity, provide terrific social opportunities, universally recommended for assisting individuals with prevention, treatment and reversal of arthritis, diabetes, hypertension, cancer and a wide variety of other health maladies. One will discover the elite benefits of the most authentic Hwa Yu Chi-Kung exercises of Rowing, Walking and Standing.Give yourself and those you love the ultimate benefits of Hwa Yu Tai-Chi, recognized as the oldest, Therapeutic Tai-Chi healthcare system in the world. Provide your family and friends with an easy-to-do, exceptionally enjoyable, safe activity with unsurpassed life-time benefits. Tai-Chi is a martial art healthcare system that helps people to develop balance and body awareness through slow, soft, graceful physical movements. Many hospital and clinical studies from around the world support the effectiveness of Therapeutic Tai-Chi (TTC). Two of the best known studies are from the United States. They were a part of a special frailty reduction program sponsored by the National Institute on Aging (NIA). The reports appeared in the May, 1996 issue of The American Geriatrics Society. Dr. Steven Wolf of Emory University School of Medicine, in Atlanta, Georgia, found that older people who participated in a 15-week Tai-Chi program reduced their risk of falling by 47.5%. Dr. Leslie Wolfson, of the University of Connecticut Health Center in Farmington, found that older people who participated in Tai-Chi gained strength and improved their balance. The participants kept their strength and balance throughout several months of Tai-Chi practice. much higher. The NIA study recommends Tai-Chi as a "low-tech" way of improving the strength and balance of older people. "The FICSIT studies have shown that a range of techniques, from the most sophisticated medical interventions to more "low-tech" methods, can help older people avoid frailty and falling," says Chanda Dutta, Ph.D., Director of Musculoskeletal Research in the NIA's geriatrics program. "We must make sure that we look at every approach, especially inexpensive ones like Tai-Chi for seniors," says Dutta. "People can do this at home and with friends once they have had the proper training." Therapeutic Tai-Chi also has been proven effective in helping heart-attack victims to recover faster. In 1996, Sheffield University in England tested 126 heart-attack patients. Researchers had them practice Tai-Chi, do aerobic exercises or do no exercise. The British Medical Association's Postgraduate Medical Journal reported, "Both forms of exercise reduced blood pressure, but only Tai-Chi showed a significant reduction." The researchers said that exercise is important in helping heart-attack patients to recover, but that many do not feel strong enough to exercise much. They said that the gentle, graceful movements of Tai-Chi could be the solution. of Tai-Chi exercise is that it is a low-technology approach to conditioning that can be implemented at relatively low cost in widely distributed facilities through the community." Tai-Chi is recommended around the world to remedy a rapidly growing number of health concerns. The Harvard Health Publication has called Tai-Chi "movement medication." You can enjoy optimal health, well-being and self-defense derived from one of the ancient Tai-Chi systems in the world, taught by Master Instructor Robert Xavier. Each class provides a wonderful social exchange, with hands-on, personalized instruction that produces the very best results. Robert Xavier has been a serious student, teacher and proponent of martial arts healthcare since the early 1960's. In the 1970's, while residing in Connecticut, he instructed his Martial Arts Physical Education programs at the following prep schools: Choate, Pomfert, Rectory, Foreman, Gunnery, Marianapolis, Greenwich, Ethel Walker's, Miss Porter's, Wykeham Rise, Saint Margaret's, Saint Thomas More, Rosmary Hall, McTerrnan, as well as at many colleges and universities throughout the Northeast. Mr. Xavier owned and operated the Canton Academy of Martial Arts. He served on the Governor's Committee on Fitness and was a clinician for New England's Association for Health, Physical Education and Recreation. He received education grants to develop martial arts physical education training film loops. He, also, authored the 3-Zone Police Defense Manual for the Connecticut Police Academy and, in 1977, introduced the 3-Zone police defense methods to Florida's Sheriffs' Association. Mr. Xavier's defense manual has been used by law enforcement throughout the country to help standardize defensive tactics. Robert, an ordained missionary/pastor and his wife, Beth, have four children and have served as domestic missionaries with Things to Come Mission since 1980. They founded and directed the Welcome Home Ministry, Key West, Inc., a residential rehabilitation program, from 1980 to 1986. In 1987, Mr. Xavier moved to Manatee County, Florida to become the jail chaplain until 1990, when he created the Women Set Free Ministry a residential rehabilitation ministry for women being released from the county's detention center. In 1998, Pastor Xavier received an honorary doctorate degree for his life's dedication to developing a Christian martial arts group-mentoring program for "at-risk" youth. The present ministry focus has been to invest in the health and eternal destiny of youth and families by providing Christ- centered after-school Grace Martial Arts ministries at local churches for home-school, private and public-school youth. His programs have been enthusiastically received and taught at the Saint Stephen's School, Community Christian School, Church on the Rock, Manatee Youth for Christ, Palma Sola Community Church, New Hope Baptist, Braden River Baptist, Woodland Community, and the Parrish Y. He is currently instructing classes at the Calvary Baptist Church and Calvary Chapel Sarasota. He also is instructing therapeutic, restorative, Tai-Chi Health and Well-being programs for local church congregations. Robert Xavier is the highest ranking instructor of Hwa Yu Tai-Chi and Yon Ch'uan Martial Arts. He is Lineage Holder and Chief Instructor of the Hwa Yu Tai-Chi system and 9th Degree Black Belt and Chief Instructor of Yon Ch'uan Martial Arts. 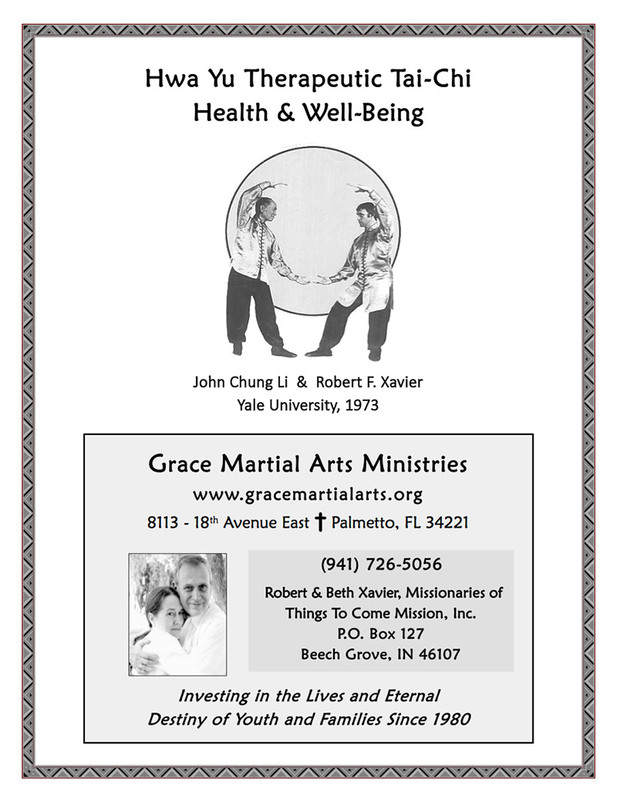 In 1980, at Yale University, Master Xavier received a Master Instructor Certification from internationally acclaimed Grand Master, John Li, in the ancient art of Hwa Yu Tai-Chi, known also as the Six Combinations-Eight Methods - Chinese Water Boxing. NO eastern religion ever will be taught by the instructor/Pastor Robert Xavier. The student practitioner is personally instructed to achieve his/her optimal affective, cognitive, psychomotor and spiritual potential. This is a brief list of Master Instructors of Hwa Yu Tai-Chi since its beginning in the early part of China's Sung Dynasty (960 – 1270AD). It is not a complete list but gives some idea of the development of Hwa Yu Tai-Chi during the past 1,000 years. Master Instructor Li Tung Fung – Senior student of Chen Hsi-I … Master Fung was theauthor of the "Five Word Song"
Master Instructor Tai Yai Chin – Changed the name from Lop Hop Pak Fat to "Swimming Boxing"
Master Yeung King Kun – From Fon Shan, called the exercise "Twelve Movements of Exercise Before Birth"
Master Instructor Shut – Called the exercise "Idea Six Combinations"
Master Instructor Chen Kong Ta – From the town of Yellow Flower in the district of Cheung Pin of the Hopei Province. 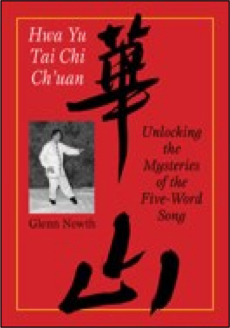 He studied the exercise under the names of "Idea Six Combinations" and "Idea Spiritual Kung Fu. Master Instructor Wu Yiek Tai – Taught Lop Hop Pak Fat in the Republic of China. General Cheng Jee Kong brought Master Tai to the Chinese Martial Art GovernmentSchool in Nanking to teach Lop Hop Pak Fat. Master Tai later lived in Shanghai and taught a few students until the Communist Government appeared. He died in 1967. I don't know where you find the strength? You brought the knowledge of Hwa Yu Tai-Chi to America. You came to teach in Europe. The seeds of your work are growing in many parts of the world. Stanley Rosenberg, Ph.D., Copenhagen. Grace Martial Arts is extremely pleased to announce the publication of this amazing book about internal martial arts health-care science. It is entitled The Chinese "Five Word Song. Hwa Yu Tai-Chi has a history of more than a thousand years and was a closed-door martial art and healthcare science until the last 70 years. Master John Li taught the art to hundreds of students in China, the United States and Europe. Mr. Li, a Chinese Christian martial artist, translated the text of The Chinese "Five Word Song" from Chinese to English and added an excellent commentary to each of the 134 verses. It's filled with tremendous insights into the philosophy and guiding principles of Internal Martial Arts from one of the true masters of the 20th Century.